Old Favorites To Trendy New Items, There's Something For everyone! "Don't get bored! 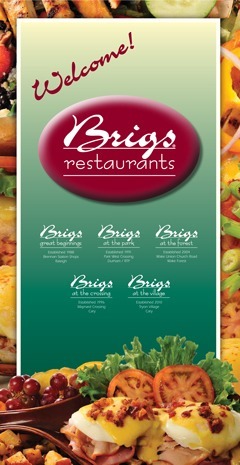 Get Brigs!" Plus, we’ve enhanced some old favorites! Perfect for anyone looking for our delicious breakfast and lunch choices in a smaller size, these also qualify for our Senior Discount! Discover our featured selections of the month to learn what delicious flavors and ingredients we’re highlighting! Learn about our special offers including our Senior Discount, Military Discount, and Half Price Birthday Specials! You can browse our full menu here online or download our full menu (with prices) Here! (Requires Adobe Acrobat Reader) We recommend printing it on legal size paper for easier reading.